In December 2015, you’ll be able to walk into any McDonald’s in Niigata Prefecture and order a gigantic 48-piece bucket of McNuggets—the chain’s largest chicken offering ever. However, there’s a good chance many people ordering this extra-super-sized item won’t even be that hungry. 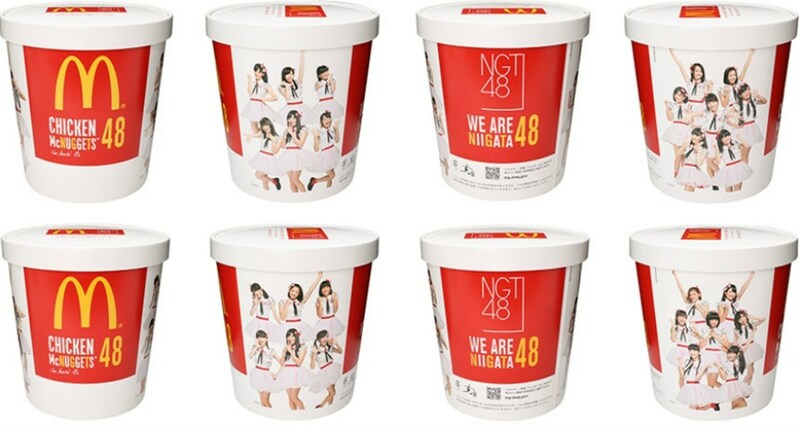 That’s because the other selling point is that the 48-piece McNugget bucket is a promotional tie-in with newly-formed J-pop idol unit NGT48, the Niigata-based sister group of idol megagroup AKB48. Each 48-McNugget container comes decorated with one of two images of NGT48’s members. As if that wasn’t enough idol appeal, McDonald’s 38 Niigata branches will also be using paper tray covers that bear the singers’ likenesses, and each 48-McNugget order comes with one of 25 limited-edition NGT48 commemorative cards—meaning a minimum of 1,200 McNuggets that superfans will have to eat to collect the entire set. The NGT48-Piece Chicken McNugget pack goes on sale December 1 for ¥1,800, and will be available until McDonald’s runs out of the special packages.